Friends! My blog, Sierra's View, has gone through a major transformation (Goodbye, LivingtheDream--you've been good to me!). Now, there are still a few tweaks that need to be made here and there (I'm not entirely sure why Facebook is making it so difficult to change the name of my Page? haha). As I was re-branding, I didn't even know where to start. 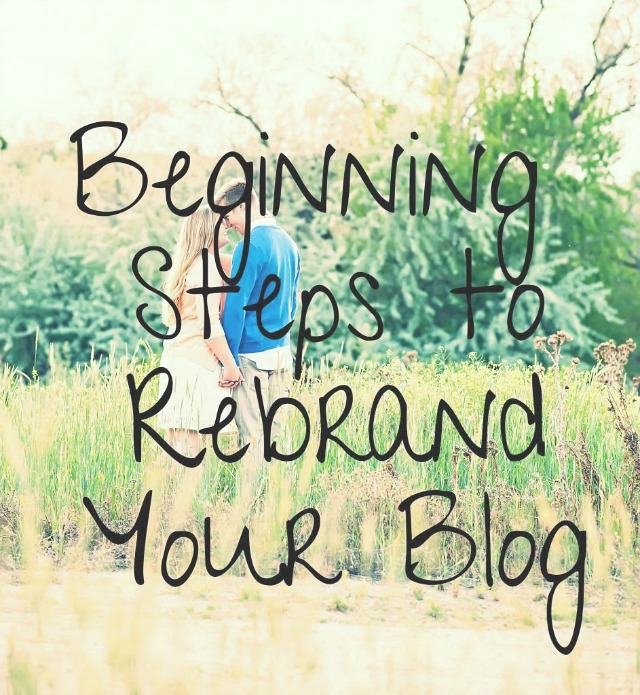 At some point, there will be some of you that will want to re-brand, so I wanted to give you a few basic pointers on where to begin this process. Hope this will give you a good idea of what to do in the beginning steps. - Simple. My blog name used to be "Oh, Just Living the Dream" and I found that every time I would try to say my blog name, it would be so annoying and long. Having your name be simple makes it easier for your readers and yourself! - Unique. You want your name to be something that people can remember! You don't want it to be similar to other peoples' blogs. 2. Make all of your Social Media Similar Names to your blog. Something that makes your life a lot easier, especially for your blog, business, hobby, etc. is to have all of your social media the same. My twitter, instagram, Pinterest usernames are all of the same. When I fill out any Shoppertunity sites, or explain it to readers, they know exactly what to look for when searching my social media sites. I decided to stick with Blogger just because the coding is more user friendly, but something that I think that makes your blog more marketable it to buy a domain. I used GoDaddy.com to buy a domain for my blog that correlated with my name. I found that this made my website more profitable and professional. If you have any Shoppertunity sites (Social Fabric, Pollinate, etc.) or other businesses that you work through, make sure to go in and change your websites and information. Make sure email and social media websites are up to date! Make business cards to pass around to people, spread the word through social media, ask questions! I was constantly texting, tweeting, calling, emailing people on little questions regarding HTML coding and making a new website. Aw, I love Sierra. She is the cutest. And her brand redesign is really fun. I'll miss Living the Dream but I love Sierra's View that much better! I agree with you, a lot of people have been telling me to make business cards so that people would know my blog. I love the idea of it, but I havent really gotten a chance to make them, but I wil soon :) i love reading advice from experienced bloggers because it makes me realize that I can do it also, I just need to be more focus. I did the same as you - I blogged for a little under a year when I changed the name and focus of my blog. These are all great tips for others doing the same. I can't tell you how much number 2 bothers me when people have different names on all their social media! Drives me crazy!! These are wonderful tips. I've been thinking about opening up an Etsy shop and I'm not sure that my blog name will be able to match up to my Etsy shop name. So, I will definitely be using these tips in the near future! Thank you for sharing! Great Tips. I found I was so reluctant to move my social media names to something in line with my brand, but since I have done it has made my blog so much more successful! I'm a first time reader here so looking forward to finding more gem posts. I've been thinking about changing from Budget Beauty to....well...idk what. That's the problem...thanks for the tips, at least now I know where to start! These are great tips! I've been considering rebranding, mainly because even though I love my blog name (Epise of Cake) I worry it is too food-oriented. I blog about baking often, but I also blog about beauty and other things, so if I do rebrand, I'll reference this post! What influenced you to rebrand, by the way?